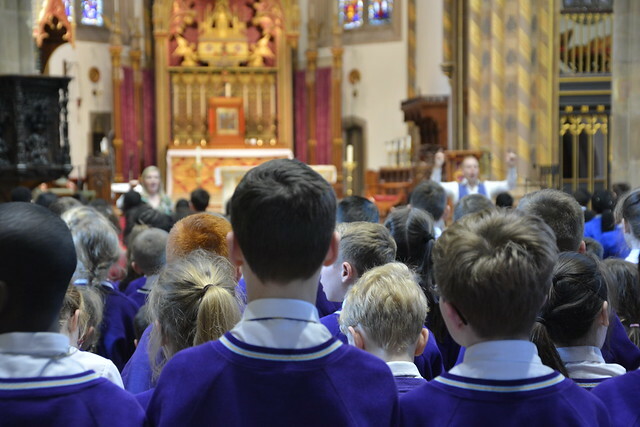 Once again, St Chads Cathedral Choral Outreach Team have been working in several primary schools this term which culminated in a Spring Choral Service on Friday 29th March in the Cathedral. The children from St Joseph’s, St Alban’s, St Philips’ and St Theresa’s primary schools spent the morning at the Cathedral taking part in workshops and rehearsals before performing a selection of hymns and songs they learnt to their friends and family in our wonderful Cathedral. The programme was set up in 2012 by Birmingham Conservatoire graduates and Cathedral choristers, David and Alexandra Wynne.